A community will come together this weekend to mark the exact day 200 years ago when a Tyneside colliery was struck by disaster. On May 3, 1815, where St Teresa’s Church now stands on Heaton Road, 110 men and boys were working underground on the early shift. The inrush trapped 75 workers. Despite valiant attempts, rescuers were unable to reach them. It was not until January 6, 1816, that the first body was discovered – more than eight months after the tragedy. Another five weeks passed before another 55 victims were found in one spot. 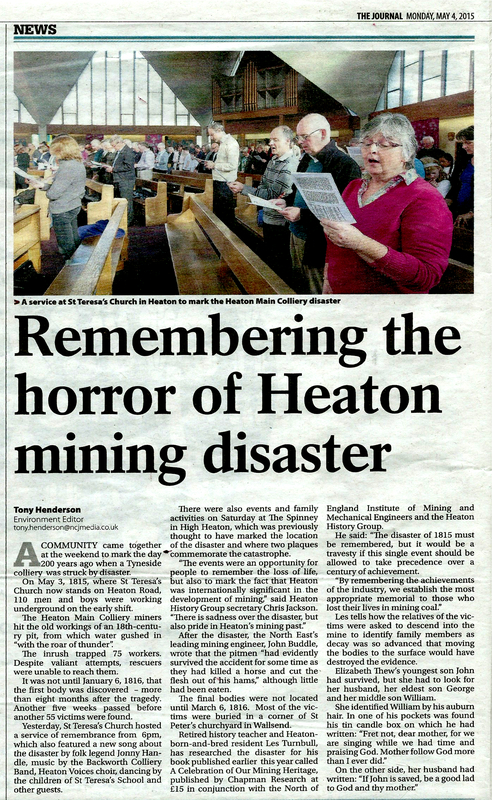 On Sunday, St Teresa’s Church will be the venue for a service of remembrance from 6pm, which will also feature a new song about the disaster by folk legend Jonny Handle, music by the Backworth Colliery Band, Heaton Voices choir, dancing by the children of St. Teresa’s School and other guests. On Saturday, there will also be events and family activities from 2pm – 4.30pm at The Spinney in High Heaton, which was previously thought to have marked the location of the disaster and where two plaques commemorate the catastrophe. Also on Saturday at 7.30pm St Teresa’s church hall will stage an evening of mining songs with Heaton Voices and the Appletwig Songbook group. Tickets are £5. The group has won backing from the Heritage Lottery Fund to research the areas’s mining history and place a series of plaques at significant locations. After the disaster, the North East’s leading mining engineer, John Buddle, wrote that the pitmen “had evidently survived the accident for some time as they had killed a horse and cut the flesh out of his hams,” although little had been eaten. The final bodies were not located until March 6, 1816. Most of the victims were buried in a corner of St Peter’s churchyard in Wallsend. 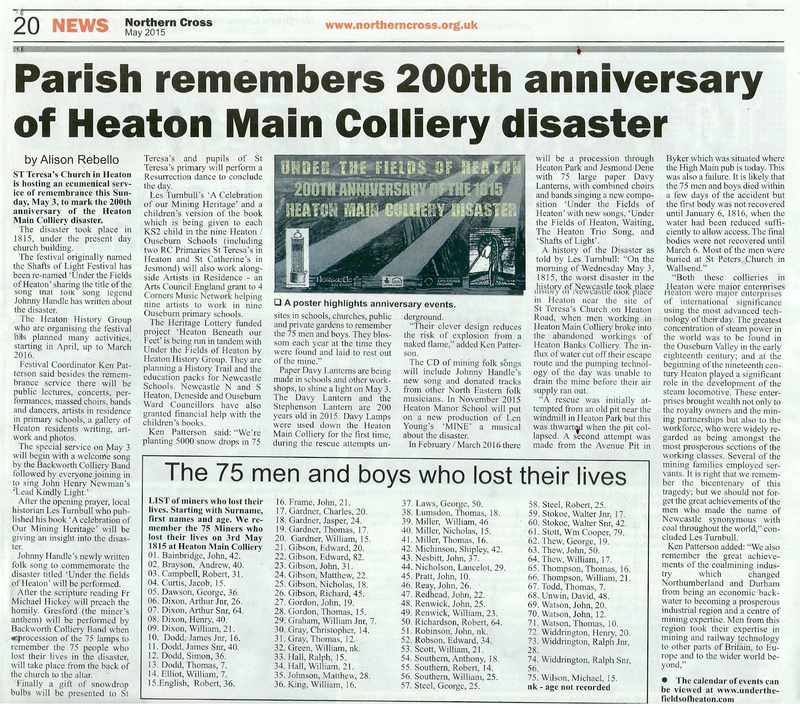 Retired history teacher and Heaton-born and bred resident Les Turnbull, has researched the disaster for his book published earlier this year called A Celebration of Our Mining Heritage, published by Chapman Research at £15 in conjunction with the North of England Institute of Mining and Mechanical Engineers and the Heaton History Group. He said: “The disaster of 1815 must be remembered but it would be a travesty if this single event should be allowed to take precedence over a century of achievement. Les tells how the relatives of the victims were asked to descend into the mine to identify family members as decay was so advanced that moving the bodies to the surface would have destroyed the evidence. Elizabeth Thew’s youngest son John had survived, but she had to look for her husband, her eldest son George and her middle son William.